Having trouble sleeping? A frantic schedule that saps the very life-blood of your struggle to keep up with change in the world we inhabit....? Look no further for something that will move with all the speed of a cataleptic sloth, the successor to Bear's End, namely Ursa Resurgat. I now have the luxury of a small room, some 3m x 2.25m in which to build a model railway. I hope it will be a OO/4mm roundy with a OO9 interchange. I could have used an alternative larger room but this room has the advantage of being lit by a 1m square Velux roof window above the 'desk' area giving over 10m of continuous wall [save for a 0.7m door] around which to range my train set. The SketchUp picture above gives the general idea, I hope to get away from straight edges where possible, but the re-learning curve of the SketchUp programme is pretty steep and this will do for now! Be warned this will be slow progress. I now have a copies of C.J. Freezer's 'Model Railway Design Manual' ISBN 1 85260 538 3, his 'PSL Book of Model Railway Trackplans' ISBN 85059 905 9 and Ian Rice's 'Railway Modelling the Realistic Way' ISBN 978 1 84425 359 3 all from local charity shops for less that £2.50 each, and intend to make good use of all three in planning the layout. Let me be the first to both congratulate you on the acquisition of a train room and wish you good fortune with Ursa Resurgat. I will be following your progress great interest. Doorway seems a bit narrow though. Good luck with that Doug. Hearty congratulations on your new ursus domum Doug. 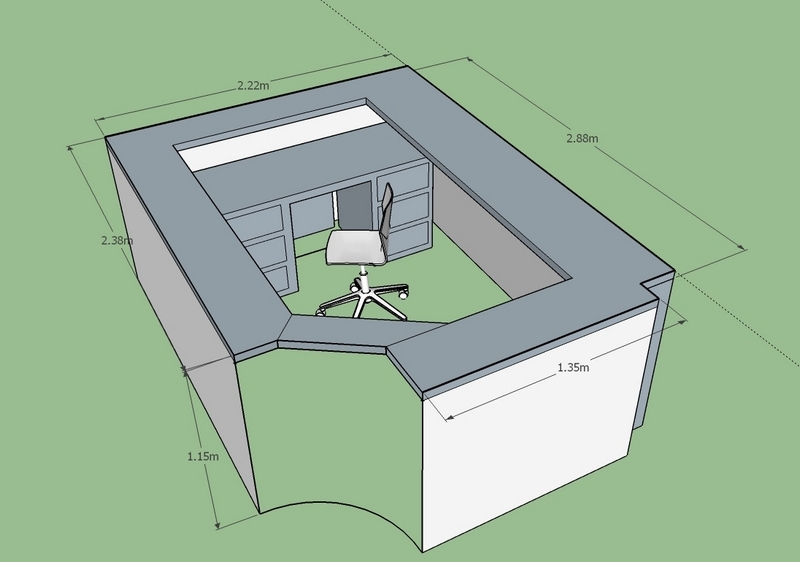 It looks comfy and also practical with the roof light directly above your work area. Have fun planning how to fill those ten glorious metres with your railway. I've pulled up a chair! Oh and that SketchUp programe looks interesting. I've looked at their site and will try it out. Thank you. I'm green Doug - your train room looks excellent and I'm really looking forward to seeing how your plans develop. The ruined "outbuilding" in which I had intended to construct Maxmill 2 has a current rebuild estimate of €35,000 so I don't think that will happen................... However, other options are urgently being explored. How's the "gateman" training going ? John, believe it or not we are forecast snow next week, I think Shelagh got me down to Devon under false pretences! Wales was hard enough to navigate inthe Spring last year when we visited Snowdonia, Shaun, hope you don't get the snow as well. Ed, the entrance is currently set at 55cm, so unless Dolly Parton wants to visit sideways on her knees, we should be alright, some curves will be added to take off sharp corners etc. As its to be wall mounted on steel two-hook brackets it'll only be that narrow for the 6" depth of the facia, hopefully. Alan, it's not luck I'll need, it's a generous state of mind from SWMBO when I send off for 'Stuff' [Oh! The thought of spending money makes me feel faint....] but I've been making a quiet note of what she is spending on Cross-stitch kits she now has over a dozen in her work box, more than I have models waiting to be built now! Bill, if you try SketchUp, may I suggest you go for the free 2016 version? [ Ver 16.1.1450 32-bit] It's called 'SketchUp Make' and has virtually all the bits and pieces that the current 'Pro' version has. The newer free is not quite so clever. If you can't download it [I re-downloaded it last night just in case they pull it] I'll send you a copy. We haven't met, so I don't know if you are follically challanged like some of our senior members [Tee-hee...] but I guarantee you will be after a few days of trying it out. Peter, they all have different values, the 'Design Manual' goes into operation, with examples of prototype practice and track formations, workable terminals drawn from real life and how they can be condensed without losing the 'function factor' , examples of industries and their infrastructure. The PSL book has70 different layouts, a number of terminal stations in a 'Terminus to fiddleyard' section, and room layouts for spaces from 2.4m x 1.95m up to 3.6m x 3.0m several of which feature 'crawl under sections across the room which may I politely suggest are of less interest to a man of your diameter calibre? There are 4 shed layouts in varying sizes and eight for garages. The Ian Rice book is one I have been after for a long time at less than its £20 price tag, it's more up to date than the others, and his writing is gently humorous, the section on 'I' and 'L' beam baseboard construction has caught my eye. I have over a dozen 'How to' books, and these three seem to be the most worthwhile. If you find a copy of Freezer's 'Model Railway Manual' [note absence of 'Design' in the title] it could partly take the place of the Rice volume. SWMBO sends her best regards! Herewith a curvy top layer A4 plan view, the previous drawing told me where and to what width I need to mount my steel brackets. Working in metric units, if I need to superimpose, say, a platform 1000mm long, I import a diagram and scale it to 0.88 size and paste it onto the plan to size/trial it, using this picture as 'Layer 1'. I have kept two straight edges, as after all I am an engineer, and engineers love straight edges. 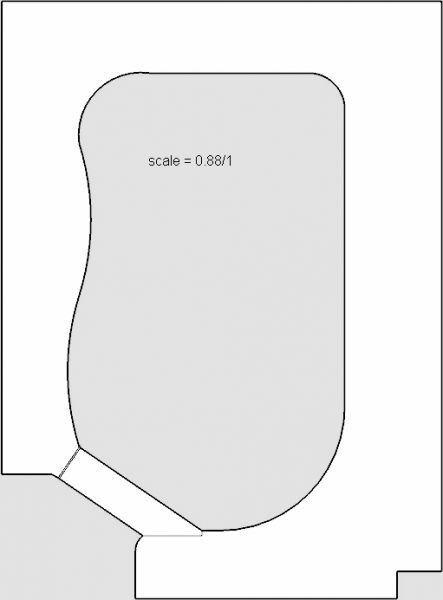 I can also measure some fanciful sketched component off this plan, multiply by 1/0.88 and lay it on top to scale.If I had an A3 printer, life would be easier and more flexible as a small error at this reduced scale could end up as a huge co%k-up in full size! Beef B'non and my last bottle of good Rioja [it's not just units I mix, willy-nilly] so little to follow today that will be even vaguely 'compost-dentist'. It does seem a bit 'dogs-breakfast' but A4 is a bit small to get it in at 1:1, I might try landscape view and stitch two pieces together to get a bigger picture. Looking forward to watching this one from the beginning ! I am already visualising some of your exquisite buildings in place of the rather prosaic "large factory building. Is the concept to have most of the activity ie the goods yard and loco servicing in 09 and the 00 activity confined to the A to A roundy roundy? Not sure if you want suggestions? If not then please ignore. I wonder if the second station would be better on the other long side rather than over the desk.......creating horseshoe effect and a greater visual distance between stations.........this would also make it easier to complete the roundy roundy over the duck under? Just a thought. John, thanks for your interest, you are quite right, the smaller station platform [in the original Freezer scheme it was the front for a quay side scene] is in the wrong place, and the main station a little too long or ambitious for the space I have. It was an interesting look at putting an established 9-3" x 7'-4" track plan in a 9'-11" x 7'-3" room space. I want to do the principal part in OO/1/76/4mm roundy-roundy with a small OO9 presence, perhaps a feeder for a drift mine mineral drop or alternatively, insulated tank wagons on a zig-zag descent top and tailed by two Tugwell-Pushleys to a SG trackside factory where the liquid butterscotch extracted by hot water injection from the surrounding hills is processed. I'll progress the OO9 on a smaller separate baseboard, one advantage of twin slot brackets [https://www.screwfix.com/c/security-ironmongery/shelf-brackets/cat880018?brand=rb_uk] and an approximately 4ft rail level is the ease with which modest stowage for 'planks' is easy to add and adjust beneath the main layout. "Not sure if you want suggestions? If not then please ignore." Deffo up for any suggestions and criticisms. 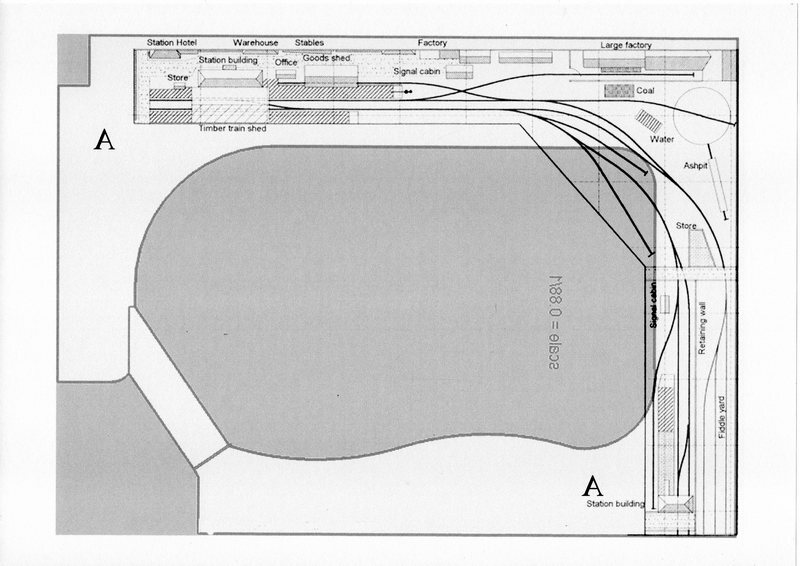 Chubber wrote: John, thanks for your interest, you are quite right, the smaller station platform [in the original Freezer scheme it was the front for a quay side scene] is in the wrong place, and the main station a little too long or ambitious for the space I have. I'll progress the OO9 on a smaller separate baseboard, one advantage of twin slot brackets https://www.screwfix.com/c/security-ironmongery/shelf-brackets/cat880018?brand=rb_uk] and an approximately 4ft rail level is the ease with which modest stowage for 'planks' is easy to add and adjust beneath the main layout. Will there be room for the treacle mine as well? Out of interest what sort of passenger traffic are you planning.......ie will it be confined to autotrain/railcar or will it be 3-4 carriages possiby involving a loco exchange/run round at the main station? The modelers dilemma. Enough space for a layout but not quite enough space for the scale (and radii, buildings, stations,...). Are you looking at this the right way - OO with an OO9 interchange? With that much space why not consider OO9 with an OO interchange? You could also increase your acreage by going double level, something that Freezer never had to think about as OO layouts were being built in what was O space, but that Rice does cover. How about a narrower upper level with the narrow gauge, one terminus up (or two up), one down with the interchange with the OO? Shades of Castle Gate with an interchange.